When you were growing up, you probably frequently heard your parents say, "Do you believe everything that you hear?" This question can be applied to almost anything, including electronic cigarettes. Don't just go on what someone tells you (including us! ), but rather check out the facts for yourself. Below are some common myths regarding electronic cigarettes, along with the facts that can help you squash the rumors you may hear as you enjoy your electronic cigarette journey. All of the information provided has been gathered by doing a simple internet search that you can (and should) do on your own. Myth #1: Electronic cigarettes lead to smoking. Fact: One recent study found that fewer than one in 300 vapors who have never smoked, started after they started using e cigs. In fact, many traditional smokers choose the electronic way as an alternative to traditional analogue cigarettes. 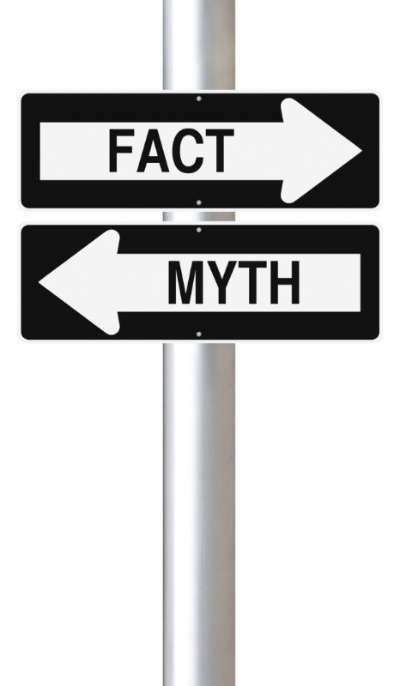 Myth #2: There is no proof that e cigs have helped people quit smoking. Fact: There is a ton of evidence showing that many people have made a wise choice to consider electronic cigarettes as an alternative to traditional smoking. For instance, results published in The American Journal of Preventative Medicine showed that after 6 months, 31 percent of e cig users did not go back to smoking traditional cigarettes. Myth #3: Electronic cigarettes cause cancer. Fact: Traditional cigarettes are full of dangerous carcinogens that are known to cause cancer. However, e cigs have never been shown to have any of these carcinogens and there have been no evidence to indicate that they cause cancer. Myth #4: Vapor is just as dangerous as traditional cigarette smoke. Fact: Not true. There are many carcinogens in traditional cigarettes that absolutely do not exist in electronic cigarettes. The "smoke" released from an e cig is actually vapor produced by water. There is also no smell or lingering effects of vapor smoke, unlike smoking. See how smoking affects taste and smell. Myth #5: E cigs explode and catch fire often. Fact: While it is true that electronic cigarettes can explode and catch fire on a rare occasion, most of these situations occur due to user error. In fact, the US Fire Administration ultimately concluded: "Considering the vast number of products in the field that use lithium-ion batteries, however, it is clear that the failure rates are low." Just to be safe, buying poor quality products or tinkering with batteries and e-liquids should be avoided. As long as you are using your device responsibly and according to the manufacturer's instructions, you don't have to worry about your e cig exploding or catching fire. Myth #6: E cigs lure teenagers and kids to begin smoking. Fact: At VaporFi, we stand by the belief that one must be of a legal age in order to purchase any type of electronic cigarette. Our packaging and variety of flavors are meant to be attractive to many people. However, our goal is never to attract an underage person. Period. Myth #7: E cigs are even more addictive than traditional cigarettes. Fact: Simply not true. While the yummy variety of flavors may make you want to keep trying more, there is no evidence whatsoever that addiction to e cigs is stronger that of traditional smoking. In fact, some researchers have actually discovered the opposite is true. Myth #8: No one really knows what is in electronic cigarettes. Fact: This belief is only true if you are dealing with a company that is completely un-reputable. Any good company like VaporFi will stand by their products and disclose exactly what is in the e cigs that they distribute. Find out what we put in our e-liquids. Myth #9: E cigs do not contain nicotine. Fact: There is nicotine in most e cigs. However, you are able to regulate the amount of nicotine concentration that you want. Users who have just switched from traditional cigarettes to electronic may decide to start out with a larger amount of nicotine to help them with the adjustment. Others may only need a small amount. Myth #10: E Cigs are made with anti-freeze. Fact: A total falsity. Any company that would like to stay around for more than a few months would never put such a toxic chemical in their product. The liquid used in e cigs contains propylene glycol, which is also found in foods and medications. In anti-freeze, the topic compound is an ingredient called ethylene glycol. There is no anti-freeze in any VaporFi products. We want our customers to be around for a long time! Feel free to refer to this article when you hear many of these myths being misused as fact. Be prepared to hear these statements, as well as many others, while you are trying to enjoy your electronic cigarettes. What can you do? For starters, you can help us dispel these rumors by becoming more knowledgeable about e cigs. At VaporFi, we pride ourselves on being forthright and transparent with our customers. If you have any questions or concerns regarding our product, don't hesitate to contact us. Meanwhile, please visit our knowledge center and blog to keep learning!